Trusted Clean 10 Qt. Backpack Vacuum - Lightweight & Easy to Use! This 10 quart Trusted Clean backpack vacuum weighs in at only 10 pounds! This makes it extremely easy to tote around and vacuum in hard to reach areas, while still being very efficient. Clean a hardwood floor, carpeting, a desktop, and heating vents all with the same vacuum. You can accomplish all of this, without ever having to stop and change any attachments. Never before has vacuuming been so easy! 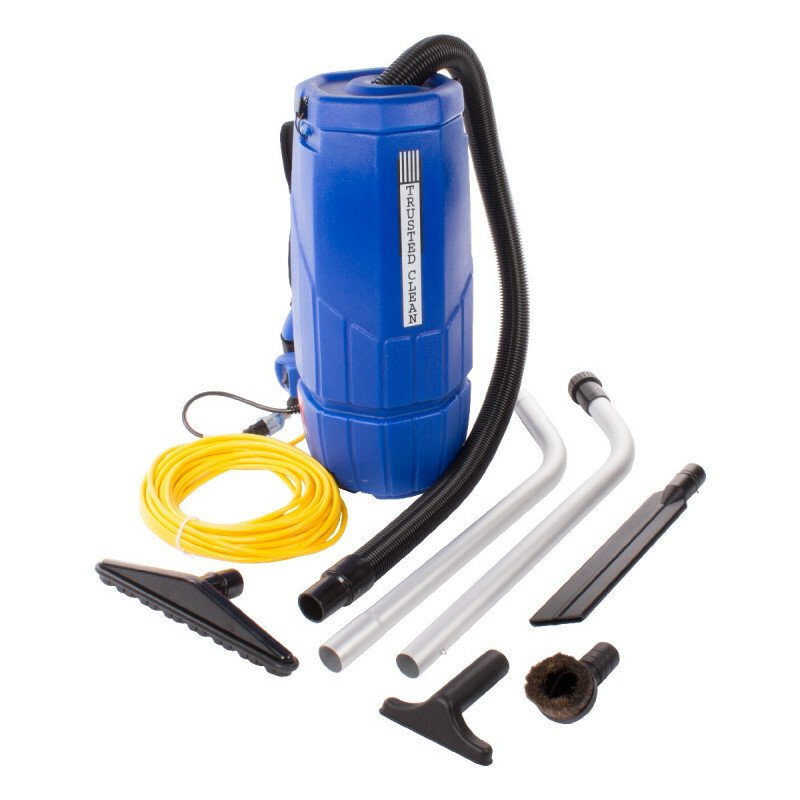 Please take a look at our complete line of backpack vacuums for a look at all of the options we have to offer. At 67 decibels, this backpack vacuum is very quiet and will not interrupt the normal work flow of the office space. It comes with a 2 year warranty, so it's extremely easy to replace faulty parts within that time period. Trusted Clean added a deflector plate to hold heavy debris away from the motor filter during use & maximize air flow. Trusted Clean abandoned the cylindrical body and tapered the vacuum-body 3/4" per side to allow air-flow around the bulging bag. Trusted Clean added 70 inches of sound deadening waffle foam materials to make the quietest vacuum in its category! Comes with a lifetime warranty on the tanks, 5 years on the vacuum motor & electrical components, and 90 days on the tools.